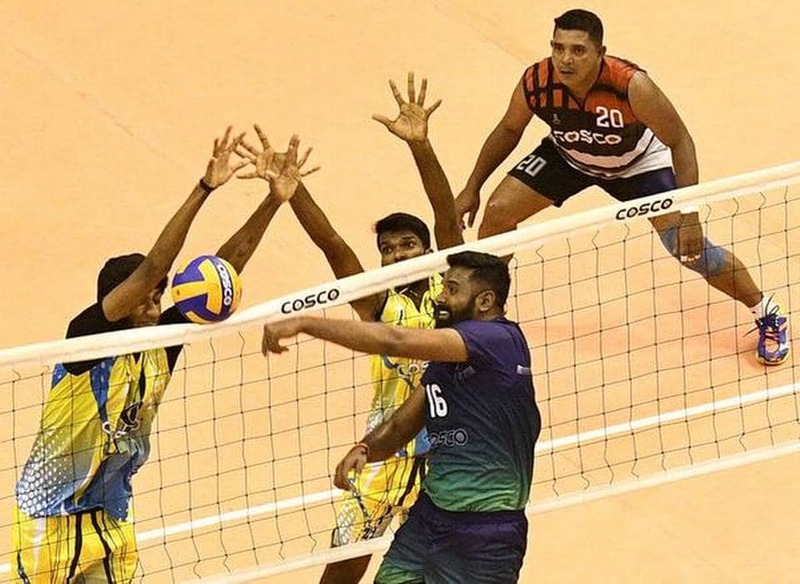 Tamil Nadu came out with all guns blazing, combining well as a unit, to script a fantastic 25-27, 25-14, 25-18, 25-16 win over two-time defending champion Kerala to reach the men’s final of the senior National volleyball championships on Wednesday. The host will take on first-timer Karnataka in the summit clash. First, Tamil Nadu blunted attacker Ajith Lal quite early and then negotiated the attack of central blocker G.S. Akhin. Both were done successfully — first by Ukrapandian and G.R. Vaishnav and then by the combine of Ukrapandian and Shelton Moses at other. Attacker Naveen Raja Jacob though erratic, unleashed his trademark smashes at crucial moments. The injury to Universal’s Jerome Vinith proved costly for Kerala in hindsight. “It was a complete team effort. Our first pass was excellent and veterans Ukrapandian and Moses showed their experience,” said TN’s head coach S. Mangala Jayapal. Earlier, Karnataka continued its dream run with a ruthless 25-13, 25-22, 25-20 win over Punjab. Once again, Ashwal Rai and A. Karthik shone with effective blocks and attack. And with attacker Raison Benet Rebello’s blistering smashes, Karnataka proved too strong. In the women’s semifinals, Indian Railways marched ahead in grand style, drubbing Maharashtra 25-19, 25-18, 25-19, while Kerala also scripted a comfortable straight-sets victory over West Bengal. It was a no-brainer as to who would win in the Railways-Maharashtra clash and only the scoreline that mattered. To be fair to Maharashtra, it wasn’t overawed by the champion team, and attacked with gusto especially in the first set. Kerala would be itching to set a record straight after having lost to Railways in previous nine straight finals. “We have the players to do that. They (Railways) have tall good blockers. We will try to overcome their defence,” said Kerala coach Sadanandan. Men: Karnataka bt Punjab 25-13, 25-22, 25-20; Tamil Nadu bt Kerala 25-27, 25-14, 25-18, 25-16. Women: Indian Railways bt Maharashtra 25-19, 25-18, 25-19; Kerala bt West Bengal 25-18, 25-9, 25-9.